This issue of RPM is composed of four research articles and an invitation to submit papers to a very special issue. The four research articles propose a variety of approaches associated with social marketing campaigns, employer branding, consumers’ choices towards hyper and supermarkets and the importance of package design in the pharmaceutical industry. All articles have undergone a rigorous double-blind review process. The last paper formalizes an invitation for a special issue, dedicated to Essays on Leadership and Marketing Management. The editorial staff, reviewers and authors are thankful for all these contributions and we hope that you, the Reader, continues to find the material presented in RPM useful, original and compelling. We welcome submissions of new materials that might further advance the understanding of marketing and consumption. 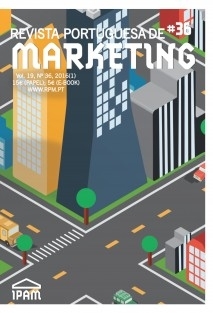 Revista Portuguesa de Marketing is an international journal, the first scientific marketing journal in Portugal. Born in 1995, with 36 issues, is published twice a year on a regular basis, plus special editions on key trendy themes in marketing and consumer behavior research. Indexed and Abstracted in: ProQuest | EBSCO | Latindex.